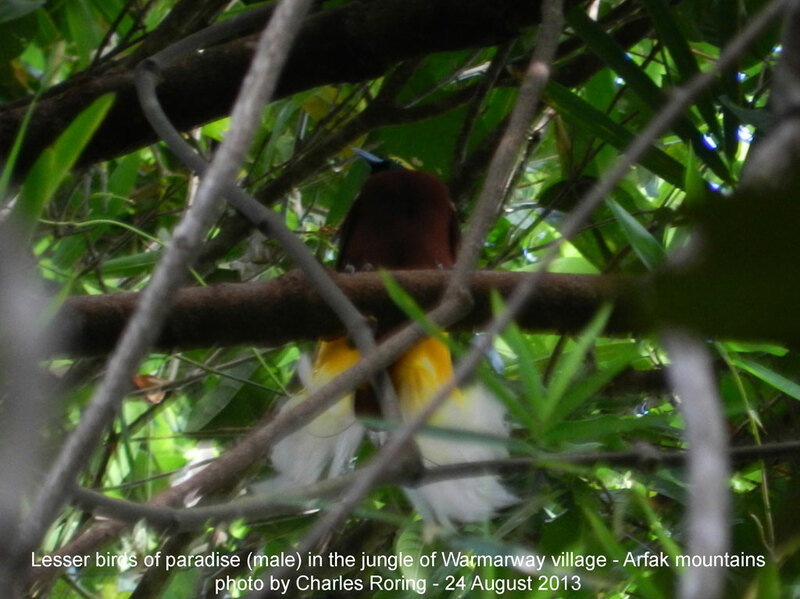 Lowland Rainforest - Some of the birds that live in the lowland rainforest of Manokwari are: kingfisher, sandpiper, pigeons, drongo, yellow faced myna, and frigate birds. The rainforest along the banks of Dopi river is the site that I highly recommend for visitors. It is around 1 ride from the city. Last week, I guided two Swedish birdwatchers on a 3-day birding trip along Dopi river. They were Thomas and Connie Holmberg. We saw tens of species of birds including Azure Kingfisher, Brahminy Kite, Moluccan King Parrot, Beautiful fruit dove, Yellow-capped Pygmy-Parrot. We also saw Pesquet's Parrot (Vulturine Parrot) that is considered vulnerable to global extinction. Lower Montane Forest - Much of the slopes of Arfak range are in the category of lower montane forest. We can see lesser birds of paradise, king birds of paradise, blue birds of paradise, sulphur crested cockatoo, Blyth's hornbill, Papuan frogmouth, brahminy kite, king fishers, as well as lory live in this area. Most of them can also be seen in some parts of the lowland region. Warmarway village is the recommended place for watching such birds. Upper Montane Forest - For tens of years, birdwatchers have been visiting Arfak mountains to watch Vogelkop bowerbird, Western Parotia, Magnificent Birds of Paradise, Spotted Catbird, Cinnamon Ground Dove as well as flame bowerbird and Feline Owlett Nightjar. There are two villages that have been famous among birdwatcher, i.e. Syioubri and Kwau. Binoculars - A good pair of binoculars will help birdwatchers find birds in the jungles of New Guinea that are dense and green. After finding the birds, you need to aim your spotting scope to the bird. Spotting Scope - This is a very important birding equipment that every birdwatcher should have. A powerful spotting scope will help birdwatcher see the detailed physical appearances and colors of the birds. Photographic Equipment - Digital camera manufacturers have launched some point and shoot or bridge cameras that are affordable to most birdwatchers. Some that I highly recommend are: Canon SX 50 HS, Sony HX 300, and Nikon Coolpix P600. Experienced birders also bring sound player and recorder (with a parabola disk) to capture and record the sound of birds. For identifying birds, Birds of New Guinea by Beehler and his friends as well as A Photographic Guide to the Birds of Indonesia by Morten Strange and Birds of Melanesia can be used as the main references.